This wall hanging was my first, from scratch, free-form quilt. I admit is does look a bit bazaar and out of the ordinary, but I don’t care. Whether the masses like it or not has no bearing on my joy. It’s 100% me. But enough about that, let’s get on with dissecting this masterpiece. 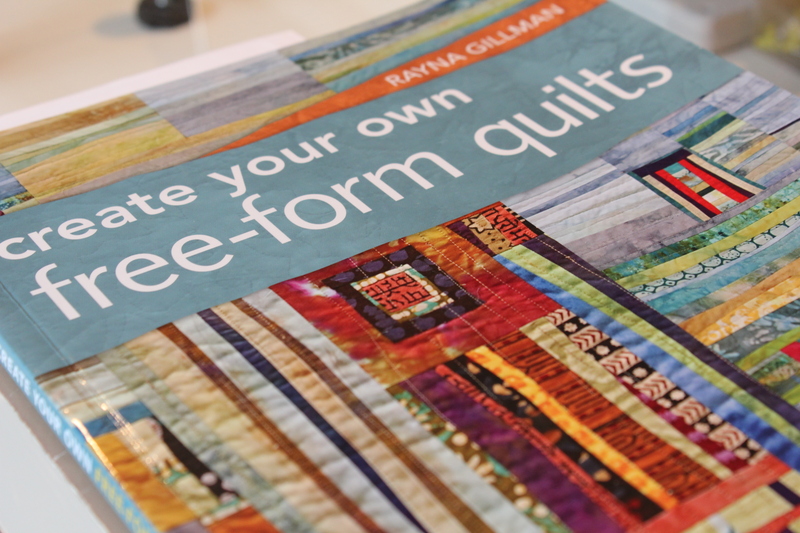 The only instructions I had to follow were those written in Rayna’s book Creating Your Own Free-Form Quilts. There were no preplanned shopping lists, and no cutting or piecing instructions. There wasn’t even a photo or diagram illustrating what the final outcome would be, just my imagination. First on my agenda was the acquisition of fabric. Finding that resource was easy. All I had to do was shop my plastic totes and baskets filled with fabrics. I’ve been quilting since the early 1990’s so my stash has become quite voluminous. Lucky for me they were fairly organized according to color. Also brought out was my stockpile of randomly sized scraps. The scraps would be my main focus. If at all possible I wanted to use up as many as I could. So where does one begin when adventuring into the unknown? If I had UFO’s to re-purpose that would be one thing but I didn’t. Not even one orphaned quilt square. Which meant I had to start by sewing together two pieces of fabric. From there I added the third, fourth, fifth, etc. There’s a saying my mother taught me when I was first learning to knit, “As ye knit, so shall ye rip.” In other words, as you knit, as with everything, eventually you will make a mistake which means backtracking and ripping out stitches. I didn’t do any ripping of seams but I did do my share of slicing and dicing as my project went through its metamorphosis. Although one glance at the wall hanging might lead you to believe it has no organization, there are definite sections or areas. During the initial phase I assembled and stitched together strips of fabric. Once carefully pressed, holding my ruler perpendicular to the seams, I used my rotary cutter to cut new strips of fabric. My self-made fabric strips were then used just like any other fabric scrap would be. Often times I added a strip of material on all four edges, pressed my seams then repeated the process all over again. These sections, while not being anywhere near “square,” served as a jumping-off-point. From there those quilt blocks were transformed even further by slicing them into sections, adding more fabric, slicing and adding fabric once again. A close inspection of my wall hanging will yield evidence of those refracted sections scattered about the landscape. I continued with that rhythm until I was satisfied with the outcome. I’ve named my wall hanging Main Street because it reminds me of the streets and intersections you might see from an aerial view of a typical metropolis. 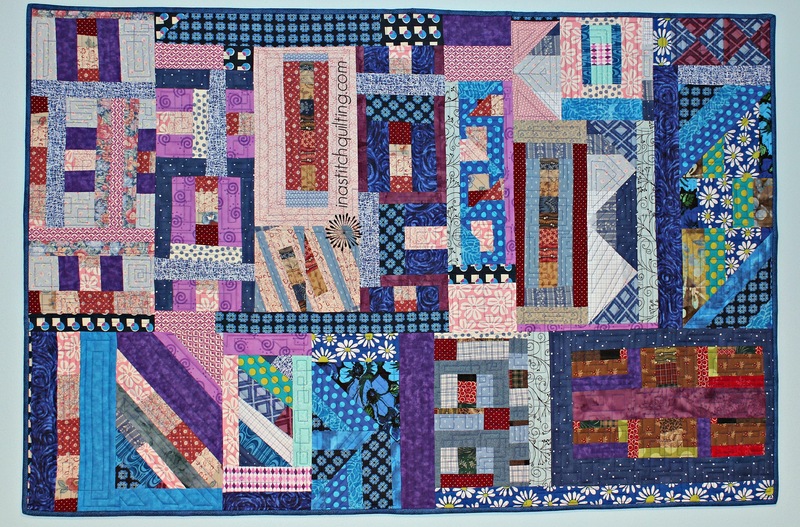 The quilt sandwich was stitched together using a square stippling pattern. I really like how creative I can get when using this method. It enables me to let my imagination run wild. No two sections are alike. That’s also another reason why I do free-form long-arm quilting, and why I don’t have a computer with preloaded stitched on my machine.